U.S. Air Force Reserve Airman 1st Class Clinton C. Hayes graduated from basic military training at Joint Base San Antonio – Lackland, San Antonio, Texas. He completed an intensive, eight-week program that included training in military discipline and studies, Air Force core values, physical fitness, and basic warfare principles and skills. Hayes earned distinction as an honor graduate. He is the son of C.E. Hayes and Cynthia D. Hayes and grandson of Donna Weaver, all of Fairfield and is a 2011 Fairfield Community High School graduate. The southern Illinois region is in the bulls-eye for several inches of total rainfall this week starting today through Sunday. The National Weather Service in Paducah has stated that anywhere from 4-6 inches of total rainfall is expected. Flooding of low land, poor drainage areas is possible, along with area rivers and streams. If you come across a flooded roadway, remember: Turn Around, Don’t Drown. 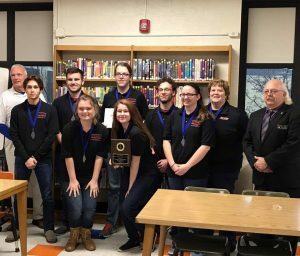 The Fairfield Community High School Varsity Scholastic Team captured first place in the Masonic Sectional Tournament on Saturday. FCHS went 7-0 on the day. They will now advance to the Masonic State Tournament in Bloomington on Saturday, March 3. FCHS defeated Mt Carmel, Salem, Teutopolis, Flora, and Effingham. FCHS defeated Effingham St Anthony in the semifinals, then they defeated Effingham in the championship. FCHS improves to 41 and 13 on the year. They will be in action again on March 1 at the Southern Illinois Academic Conference Tournament in Mt Vernon. Attorney General Lisa Madigan is alerting Illinois residents to a scam using her office and name offering free money in an attempt to solicit personal information from people. Madigan’s office has received consumer complaints from people who have received solicitations from social media accounts on Facebook and Instagram that provide links to get “free money” from her office through alleged government grant funding. If you receive a message claiming to be from her or the Illinois Attorney General’s office, Madigan says do not respond or click on any links and contact her office directly to report the scam. The Fairfield Police Department has issued a reminder that this is the final week that applications for Fairfield Police Officer may be picked up at the Fairfield City Hall. All applications must be returned by 3 p.m. this Friday, February 23 to be considered. There is a non-refundable $20 fee at the time the application is picked up. A mandatory orientation will be held on Friday, March 2 at 5 p.m. at the Fairfield City Hall and physical testing will be held on Saturday, March 3 at 8 a.m. at Fairfield Community High School. The Fairfield Police Association will be hosting its 17th annual 3 on 3 basketball tournament at Fairfield Community High School with the assistance of the Fairfield Lady Mules Basketball Team. The dates for the tournament have been set for Friday night, March 9th for the 6 ft. and under and Saturday morning, March 10th for the open class. You have to be high school age or older to play. The entry fee is $50 per team of three or four players. Entry forms may be picked up at the Fairfield City Police Department. Forms and entry fees need to be returned to the police station no later than Monday, March 5. For more information, call the Fairfield Police Department and ask for officer Charles McMeen. The Geff Ruritan Club will host a benefit for Trena Cline to go toward her medical bills. The benefit will be held at the Geff Ruritan building on Saturday, February 24, with serving starting at 4:30 p.m. On the menu will be beef & noodles and chicken & noodles, mashed potatoes, dessert and drinks. Cost is by donation. The public is invited.